Lerner’s job includes negotiating agreements on behalf of condos, giving legal guidance during and outside of board meetings, and working as counsel during board elections. She also has witnessed fist fights. Lerner likens her job to that of a city attorney. She is there to give the best legal advice without getting involved in the politics or succumbing to political pressure, she said. Lerner sometimes has to play peacemaker. “To me, trying to balance the different needs of the different homeowners, that’s always fascinating,” she said. Lerner didn’t set out to pursue condo association law. It was more a sequence of events, and advice from her father, that led her there. While she was in law school, her parents lived in a Hallandale Beach condo and her father became the board president. Even in 1982 when the region was less crowded, he foresaw condominium law becoming big, Lerner said. “Jeez, this is going to be a whole new area of law. It’s going to be huge with what’s happening with building and development,” Lerner recalled him saying. Once at Siegfried Rivera, she embarked on this specialty and said it was the right choice. Most associates don’t get to work directly with clients for some time, but community association law gave Lerner the chance to go into the field right away, she said. Lerner became partner in 1986. Recently, she was appointed to the Florida Bar’s new condominium and planned development law certification committee, which provides certification for condo and planned development attorneys. 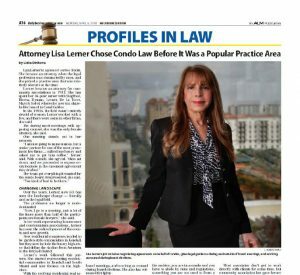 Our firm salutes Lisa for her role as one of the pioneers of the practice of community association law in South Florida that was chronicled in her “Profiles in Law” article in today’s Daily Business Review. Click here to read the complete article in the newspaper’s website.